Belize is synonymous with perfect weather, white beaches, friendly locals and incredible archaeological findings. Little wonder that tourism is one of this Central American nation’s major industries. Let’s take a look at a few of the reasons tourists can’t get enough of this tropical paradise. Belize is just three hours from Texas and seven from NYC, making even a weekend visit worthwhile. Not only that, but Belize is the only English-speaking country in Central America. That means no language barrier for those without a second language in their arsenal. Finally, Belize’s currency is pegged to the US dollar, with 1 Belize dollar always equal to 2 US dollars. Many places also take US currency, although change is given in Belize dollars. The great outdoors is Belize’s most incredible offering. From picturesque beaches to lush jungles to deep caverns, this tropical paradise will satisfy your adventurous side. You can deep dive in the Great Blue Hole, go zip lining over the forest canopy in Bocawina, or try your hand at rappelling down a waterfall. Hiking, trekking, tubing, water sports and horseback riding are just some of the adventures Belize serves up. Belize is a nation of rich cultural diversity that stems from its storied history. Once home to the Mayans, it later became a British colony that was frequently contested by the Spanish. The emigration of the Garifuna resulted in additional diversity to the nation, where most locals are of multiracial descent. From ancient Mayan ruins to British colonial architecture to traditional musical styles, the country’s history informs the Belizean experience today. With its ocean and jungle environments, Belize is home to thousands of species of wildlife. More than 500 species of birds flit through its trees, and hundreds of reptiles, amphibians and mammals can be spotted on its shores. Jaguars, ocelots and mountain lions lurk in the jungle, and parrots, toucans and macaws sing overhead. Any hike or tour comes with the possibility of spotting kinkajous, crocodiles, howler monkeys and manatees, while diving can put you face to face with whale sharks, rays, turtles and reef fish. Eating and drinking are popular pastimes in Belize, which is famous for its fresh-caught seafood and fruity drinks. Combining the best of West African, Caribbean and Central American flavors – along with Asian and Western touches – Belizean cuisine is without peer. Sip a Belikin beer, cashew wine or rum along with grilled conch, barbecued lobster or tangy ceviche. Serre la sus, a fish soup, chicken escabeche, a type of fajita, and simple but delicious rice and beans are also on the menu. Marie Sharp’s hot sauce is the perfect garnish, while tropical fruit rounds out the dessert menu. 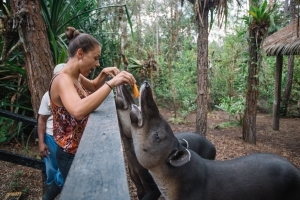 If Belize is on your list for an upcoming vacation, we’d love to have you at Sirenian Bay. Get in touch to experience paradise first-hand.